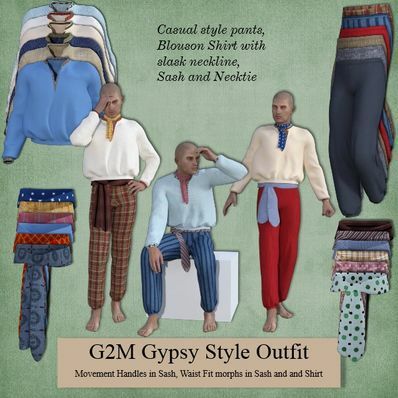 Gypsy Style Outfit for Genesis 2 Male for use in Daz Studio 4.8. Waist Fit morphs in Shirt and Sash. Movement Handles in Sash. Several textures included so you can mix and match as you please. Looks great! Thank you, Wendy! Thanks so much for sharing this amazing outfit!! This looks very, very nice. Thank you! Perfect for my Elshar characters!! Thanks so much!! I've been looking for a simple outfit like this for years!!! Thanks Wendy for these unique Gypsy style items. Much appreciated. Great work again! Thank you very much! Whoa! This will go so well with DAZ3D's Gypsy wagon! I don't think I would have any clothes for G2M or G3M if it wasn't for you. Love the sash and all the textures. Love how the shirt drapes and how the pants close at the bottom, and all the various textures! Thanks so much for your generosity! Well done! In particular, the billowing of the shirt is beautiful. Thank you so much for sharing your work with us. So lovely!